Requirements were REWRITTEN effective January 1, 2015. Whitewater. Those supervising whitewater activities must be and certified as whitewater canoeing or kayaking instructors by the American Canoe Association or have equivalent certification, training, or expertise. The instruction and experience necessary to complete the Whitewater merit badge requirements are intended to prepare the Scout for his initial whitewater experience. The objective is to introduce the skills and equipment with emphasis on safety and self-protection. A Scout earning this award will have taken the first step toward whitewater proficiency, but will achieve true proficiency only through further training and practice under proper supervision and conditions. A Scout earning this merit badge should have a keen appreciation of the risks and precautions of whitewater sports to help ensure that future whitewater activity will be conducted in a safe manner. He must fully understand and appreciate the limits of his own ability and experience. A counselor who does not believe the Scout has reached this level of skill and understanding should not award the merit badge. 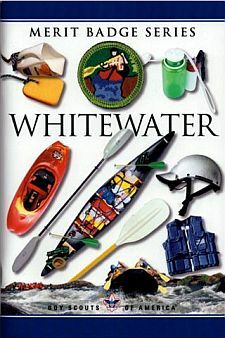 Whitewater instruction should follow all requirements, procedures, and techniques presented in this pamphlet. Supplemental Information and additional strokes should not be introduced until the basic requirements are met. The learning objectives emphasize safety and basic skills proficiency. It is the merit badge counselor's responsibility to follow all BSA safety policies, especially Safety Afloat and the safety guidelines set forth by American Whitewater. On-the-water instruction and practice, including the whitewater trip specified in the requirements, should be limited only to rapids with a rating of Class I or Class II. The minimum time for training is that which leaves the Scout prepared. The time needed for the Scout to reach adequate proficiency will vary depending on several factors, including class size and previous flatwater skills. Plan on 15 to 20 hours of instruction and practice, plus the required trip. The instructor-to-pupil ratio should be kept small, around 8 to 10 Scouts per pair of instructors. A recommended merit badge course outline can be found in the aquatics section of the BSA publication Camp Program and Property Management, No. 20-920A. A whitewater merit badge counselor must be designated by the local council service center. Persons trained as whitewater, canoeing, or kayaking instructors by the American Canoe Association, the American Whitewater, the U.S. Canoe Association, or by other agencies recognized by the BSA National Health and Safety Service are qualified for designation as Whitewater merit badge counselors. Persons currently trained as BSA Aquatics Instructors can assist local councils in planning for whitewater instruction and identifying whitewater counselors.